Breathing takes place at least 20.000 times a day. Breathing is connected with life and energy. It also takes energy. Imagine you could improve your breathing efficiency by 10% ! Or much more? Imagine it could be easier, softer, more enjoyable, more efficient .. In this workshop you will experience how to improve your breathing in connection to movement, coordination, posture and emotions! 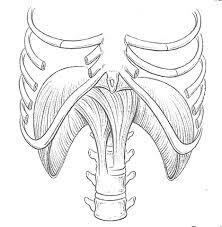 You will understand more about breathing structure, anatomy and mechanics. And you will feel change. For singers, actors and wind players these workshops will be an invaluable tool: to breathe from a deeper understanding of anatomy and function. In a series of 3 workshops ( 3 hours each) you will get a deeper understanding of how breathing anatomy and function really works. This will prove to be invaluable in your own training, playing and teaching. Workshops on breathing are also available for Choirs and can be a boost for conventions or ensemble days. Being a professional wind player, I have encountered various problems such as hyper/ hypo ventilation, severe Pneumothorax, and have once been diagnosed with astma. I have overcome these problems and function quite well, giving workshops, running and playing the flute. It is my goal to share. To that end I use all I learned from flute playing, from various breathing methods, and above all the Franklin Method.